1 “Lamech and His Two Wives.” Color printed drawing, 1795. Author’s Collection. It is difficult to make any completely false generalization about the Blake market in 1974 and 1975. Prices were up; prices were down. It was a good market for buyers (of certain types of materials); it was a good market for sellers (of other types of materials). New record prices were set, while important works failed to find buyers even at moderate prices. It was the worst of times; it was the best of times. A combination of economic difficulties, particularly in Britain, and a strong book and print market over the last ten years drove a number of medium-priced items out of hiding. In his 1921 Bibliography of William Blake, Geoffrey Keynes noted that the third edition of Erasmus Darwin’s Botanic Garden (1795) was “considerably scarcer than the other two.” In the last two years, no fewer than ten copies of this edition appeared on the market, three more than the first edition and eight more than the second. In the 1920s, the Botanic Garden was not traded primarily as a Blake item. But now it is, and thus the third edition, containing an additional plate by Blake after Fuseli, is more valuable than the earlier editions. The third was never any rarer, in absolute terms, than the others, but the market made it seem that way until dealers began to ferret out what is now the most profitable edition. A similar deluge of etchings by Samuel Palmer rumbled through the auction and print dealers’ catalogues. In the face of all this activity, book and print prices did not continue to accelerate quite as rapidly as in previous years, but no significant backsliding occurred. Collectors who were willing to meet the market prices had many opportunities to expand their holdings, particularly of books with Blake’s commercial engravings, but true bargains were scarcer than ever. Book and print prices rarely fall dramatically, in part because the inner circle of larger dealers is able to keep auction prices up and hold items for long periods without cutting the retail price. The most expensive works are more subject to pressures growing from the condition of the general economy. On 21 March 1974, the “Preston” colored proof of Jerusalem pl. 41 brought £13,000 at a Sotheby’s auction—no doubt a world record for a single leaf from one of Blake’s illuminated books. The other end of the market was reached on 28 November 1974 in the same rooms, when two of Blake’s 1795 color printed drawings (illus. 1, 2) failed to attract serious bidders and were bought-in far below the minimum estimates. 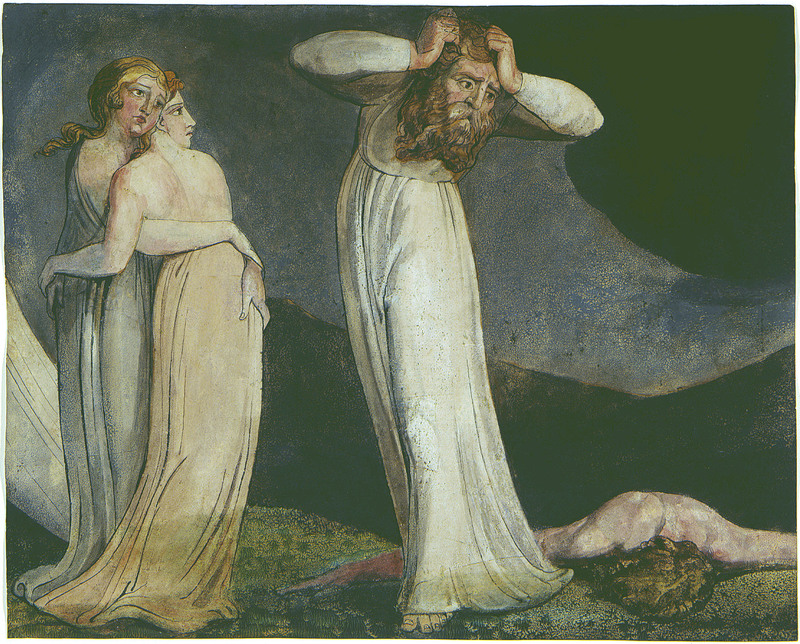 Both “Pity” and “Lamech begin page 54 | ↑ back to top and his Two Wives” had unfairly acquired reputations as little better than ruins, partly through comparison with the magnificent Butts copies in the Tate, but that any work executed in one of Blake’s most interesting techniques should be ignored by major dealers and collectors is surprising. In the past, Blake’s drawings regularly sold at auction for as much as twice the estimate, but we can no longer assume that this will happen without fail. “War Unchained” failed to meet the reserve at Christie’s on 17 June 1975, and “Theotormon Woven” sold for only £20 over estimate at Sotheby’s on 27 November 1975. The drawings market will probably continue to bounce about over the next few years, but high reserves and the stabilizing maneuvers of the major dealers will prevent the small collector from picking up important works at bargain prices. 2 “Pity.” Color printed drawing, 1795. Collection of Colin Franklin. tripled the length of the present survey. On the whole, prices for these materials have risen since the 1972-73 period about 5 to 10% more than the general rate of inflation. The only noticeable exceptions to this rule of thumb are the most sought-after Blake Trust facsimiles now out of print. I have made no attempt to search out every minor auction catalogue or dealer’s list for inclusion here. All Sotheby, Sotheby Parke-Bernet, and Christie’s sales have been covered, as have the catalogues of the major book dealers and art galleries who regularly deal in original Blake materials. I would very much appreciate Newsletter readers informing me of any sales, particularly from obscure corners, during 1976 and 1977. I wish to thank Prof. G. E. Bentley, Jr., and Ruth Lehrer for their help in compiling this survey. “The Battle of Hastings.” Pencil & wash, signed. 26 × 36.2 cm. Agnew & Sons, 102nd Annual Exhibition of Watercolors and Drawings, Jan.-Feb. 1975, #22 (£1200). This very early and very clumsy composition is reproduced, with a note by Martin Butlin, in the Newsletter, 9 (1975), 49. Blake, portrait of. Described in the cat. as “Circle of William Blake, Portrait of the Artist.” Pencil & gray wash, 9 ⅝ × 8 in., oval. C, 5 March 1974, #77, illus. (Baskett & Day, $1932). Now in the author’s collection. Attributed to John Linnell by Martin Butlin in Blake Studies, vol. 7 no. 2, pp. 101-03 (repro. on cover). Blake, portrait sketch of him walking. Pencil, by George Richmond. SL, 21 March 1974, #22, illus. (withdrawn). Repro. Wicksteed, Blake’s Jerusalem, pl. 11. Blake, portrait of, copied from the Notebook sketch; portrait copied after the sketch by Linnell; two drawings after Blake perhaps by W. B. Scott. C, 25 Feb. 1974, #150 (Shelton, $12). “Every Man Also Gave Him a Piece of Money,” variation on Job illus. 19. Pencil, pen, blue & gray washes, 23 × 18 cm. SL, 21 March 1974, #16, illus. (Colnaghi, £9500). From the Robertson and Preston collections, repro. Keynes, ed., Drawings of Blake (1970), no. 79. Jerusalem, two studies for. 14 × 28 cm. ; SL, 10 Jan. 1974, #52 (Mrs. K. Abbott, £12). The cat. designation of “Blake,” rather than th full name, indicates that these are copies made by another hand.1↤ 1 Sotheby’s and Christie’s use a simple code in their catalogues to indicate how certain they are of their attributions. The full name of an artist (thus, “William Blake”) means that the auction house believes that the work in question is by the artist. The initials of the forename (s) and the surname (W. Blake) means that the work is of the period of the artist, in his style, and may be wholly or in part his work. The surname only (Blake) means that the work is in the artist’s style and may be of his period or later. “Lamech and his Two Wives” (illus. 1). Color printed drawing, Pease collection. 38.5 × 48 cm. SL, 28 Nov. 1974, #136, illus. in color. Bought-in far below the estimate and sold privately to Colin Franklin, Oxfordshire. Now in the author’s collection. “Parents of Civilization, Legislation, and Commerce,” with an alternate figure of Legislation, inscribed. 2 pen & wash drawings, 9 ¾ × 12 ¼ in. Plus two drawings in the style of Stothard. C, 18 June 1974, #13 (Richards, $38). The cat. designation “W. Blake” indicates that these drawings are not by Blake but in his style. Same group, with the addition of “Cain and Abel” by Joseph Nollekens, sold C, 22 Oct. 1974, #15 (Sanders, $25). “Pity” (illus. 2). Color printed drawing, Pease collection. 41 × 51 cm. SL, 28 Nov. 1974, #136, illus. in color. Bought-in far below the estimate and sold privately to Colin Franklin, Oxfordshire. As of Dec. 1975 in Franklin’s collection. “Theotormon Woven,” pencil, 20 × 16.5 cm. SL, 27 Nov. 1975, #7, illus. (Wordsworth, £520). Repro. Newsletter, 7 (1973), 7, from the David J. Black collection. “The Third Hour of the King of the Jews.” Watercolor, 13 ⅛ × 13 ⅝ in. Weston, Robertson, Bruce collections. Repro. Keynes, Blake’s Illustrations to the Bible, no. 138. C, 4 June 1974, #134, illus. (L. D. Feldman, $35,280). Subsequently offered for sale by Feldman’s House of El Dieff, Fortieth Anniversary Catalogue, 1975, #11, illus. in color ($50,000). “A Vision.” Pencil & gray wash, inscription by Tatham. 17 × 18 cm. SL, 21 March 1974, #17, illus. (A. Chambers, £2800). Repro. Preston, ed., Blake Collection of Robertson, pl. 58. “War Unchained by an Angel, Fire, Pestilence, and Famine Following” (recto); and studies of children’s heads and limbs (verso). Pen & ink, gray wash (recto); pencil (verso). 7 × 8 11/16 in. C, 17 June 1975, #87, recto illus. (bought-in at £1575). Recto, verso repro. Newsletter, 7 (1973), 4, 6, from the Donald Davidson collection. “Woman Guarded by a Lion.” Drawing in Blake’s style by another hand, 21 × 30 cm. SL, 22 May 1975, #12 (£8). Allen, Charles. A New and Improved History of England, 1798. Plates extracted from, by Blake after Fuseli. SBNY, 8 May 1975, #454, with “Tornado” and “Fertilization of Egypt” by Blake after Fuseli, and an etching by Goya ($375). “The Beggars Opera,” Blake after Hogarth, fourth state. SB, 2 July 1974, #183 (Lakeside Studio, £35). “Chaucers Canterbury Pilgrims.” SL, 28 March 1974, #67, second state, illus. (J. Stray, £2100). SB, 15 April 1975, #16, fourth state on heavy wove paper slightly foxed, illus (£280). The fourth state impressions pulled by Colnaghi late in the nineteenth-century are often weak. This is probably the reason for the low price of #16. SBLA, 29 June 1975, #82, fourth state, only a fair impression ($2200). “Christ with a Bow, Trampling Upon Urizen.” Designed by Blake, engraved by Thomas Butts, Jr., under Blake’s direction. C, 14 Oct. 1975, #258 (Edmunds, £189). “Fertilization of Egypt,” Blake after Fuseli, extracted from Darwin’s Botanic Garden. SB, 30 April 1974, #21 (Lakeside Studio, £20); 2 July 1974, #180 (Lakeside Studio, £35); #182 (Lakeside Studio, £30). Dante, illustrations to. Complete set of 7 pls. on laid India paper in portfolio with original cover label. SL, 11 July 1974, #17A, one pl. illus. (Edmunds, £3700). The first complete Dante set to come to auction in many years. Although the sale catalogue describes these as “one of 100 sets pulled in 1892,” they are excellent impressions. Dante illustrations, pl. 5 only (“He ey’d the serpent and the serpent him”). C. & J. Goodfriend, Summer 1975 cat. 2, #24 ($2000). Dante illustrations, pl. 7 only (“wherefore Dost Bruise Me?”). SBNY, 8 May 1975, #453, foxed ($750). Jerusalem, pl. 25, design only; portion of frontispiece to Europe on verso. The Preston colored proof. 16.5 × 16 cm. SL, 21 March 1974, #18, illus. (W. R. Cummings, £7000). Jerusalem, pl. 32, design only; trial proof of Europe title-page on verso with figures drawn in. The Preston colored proof. 17 × 16 cm. SL, 21 March 1974, #19, illus. (W. R. Cummings, £12,000). Jerusalem, pl. 41, design only; portion of Europe frontispiece on verso. The Preston colored proof. 13 × 16 cm. SL, 21 March 1974, #20, illus. (W. R. Cummings, £13,000). Jerusalem, pl. 47, design only; trial proof of Europe title-page on verso. The Preston colored proof. 15 × 16 cm. SL, 21 March 1974, #21 (H. Moss, £11,000). Job, Illustrations to. 22 engraved pls., complete. SL, 18 Feb. 1974, #68, published proof impressions (G. Walker, £2800). C, 16 July 1974, #205, final states on laid India paper, probably Linnell restrikes (Knoedler, $4536); 29 Oct. 1974, #6, final states on laid India paper (Lakeside Studio, $6048); C, 2 July 1975, #10, final states on Whatman Turkey Mill 1825 paper, pl. 5 illus. (£2310). House of El Dieff, Fortieth Anniversary Catalogue, 1975, #13, published proofs in original wrappers uncut, pl. 10 illus. ($12,350). Quaritch, Spring 1975 cat. 946, final states with original cover label (£2500). Thackrey & Robertson, Blake and Palmer cat., Sept.-Oct. 1975, #1-21, final states ($650 each). Hauswedell & Nolte, 5 June 1975 cat. 206, #181, published proofs ($5460); 26-28 Nov. 1975, cat. 208, #606, published proofs, pl. 6 illus. (9,500 W. Ger. marks). Job, 14 of the 22 pls., published proofs. SBLA, 29 June 1975, #83 ($2800). Job, pls. 1, 3, 4, 6, 9, 17, 18, final states. SB, 2 July 1974, #185 (Louise King, £1300). Job, title-page. SBNY, 7 Nov. 1974, #196, with 3 other prints by Bauer and Gigoux ($150). Job, pl. 6. SB, 2 July 1974, #184, final state (Lakeside Studio, £130). SL, 11 July 1974, #17, published proof (Craddock & Barnard, £150); subsequently offered for sale by Craddock & Barnard, July 1975 cat. 131, #42 (£260). SBLA, 29 June 1975, #84, final state ($35). Job, pl. 8. Weston Gallery, May 1975 cat. 5, #3, published proof, illus. ($708). Job, pl. 9. SBNY, 8 May 1975, #452, final state ($350). Job, pl. 10. SBNY, 7 Feb. 1975, #315, final state on laid India paper ($375); 13 Nov. 1975, #19, final state on laid India paper ($350). Job, pl. 20. Weston Gallery, Jan. 1975 cat. 12, #3, published proof, illus. ($587.50). “Mrs. Q,” Blake after Villiers, and “Windsor Castle,” G. Maile after J. B. C, 16 July 1974, #174 (Sanders, $176). “The Parting of Lot and Abraham” and “The Fugitive Shechemites.” Extracted from Edward Kimpton, A New and Complete Universal History of the Holy Bible, 1781(?). SB, 2 July 1974, #186 begin page 56 | ↑ back to top (Maggs, £55). The plates in this first state are much rarer than the second states published in Maynard’s Josephus. 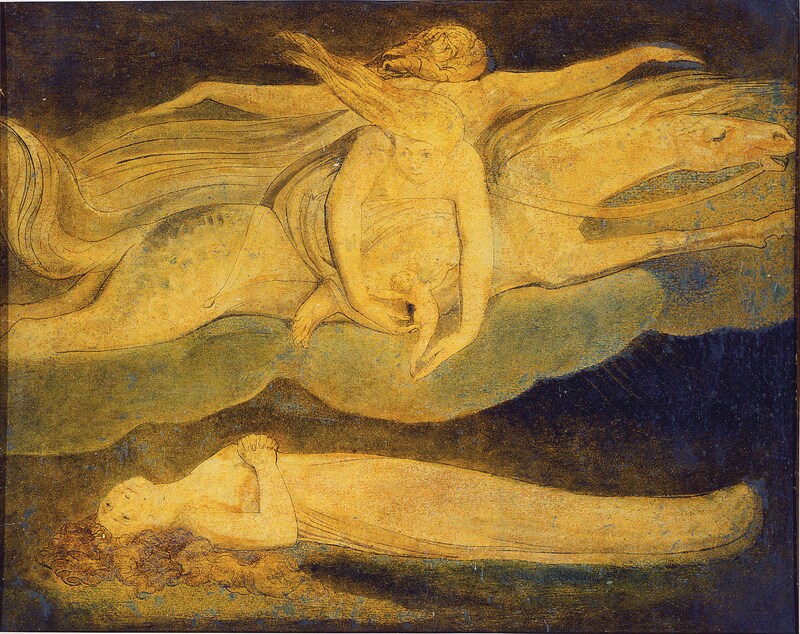 “Queen Katherine’s Dream,” Blake after Fuseli, extracted from The Plays of William Shakespeare, Steevens’ ed., 1805. SB, 30 April 1974, #22 (Lakeside Studio, £20). Ritson, Joseph. A Select Collection of English Songs, 1783. Eight pls. only, extracted from the book, including 6 by Blake after Stothard. SB, 30 April 1974, #20 (Lakeside Studio, £70). Stothard, Thomas. An album of prints after, including some by “W Blake,” not further identified in the catalogue. C, 22 Oct. 1974, #187 (Sanders, $138). “Tornado,” Blake after Fuseli, extracted from Darwin’s Botanic Garden, third ed. SB, 2 July 1974, #181 (Lakeside Studio, £30). Ariosto. Orlando Furioso. Hoole’s ed., 5 vols., 1783. Blackwell’s, June 1975 cat. 1027, #271 (£50). Blair, Robert. The Grave. SL, 18 Feb. 1974, #108, first quarto ed., 1808 (Dawson, £130); #246, second quarto ed., 1813, original boards (A. G. Thomas, £48); #248, Camden Hotten restrikes in original portfolio, 1870 (A. Edmunds, £20). SB, 2 July 1974, #179, second quarto ed., 1813, original boards (Ganymede Graphics, £85). SL, 11 March 1975, #319, first quarto ed., 1808 (Louise King, £40); 11 March 1975, #322, Camden Hotten restrikes in original portfolio, 1870 (M. Ayers, £1). SH, 11 April 1975, #460, Camden Hotten reissue, original cloth, 1870 (D. Heald, £22). C, 30 April 1975, #163, first quarto ed., 1808, uncut in boards with cover label (£140). SB, 24 June 1975, #1, plates only, states not identified (£50). SL, 21 July 1975, #55, first quarto ed., 1808 (£70). SH, 20 Nov. 1975, #96, first quarto ed., 1808; #97, first quarto ed., 1808, incorrectly described as a “folio.” Alan Thomas, Fall 1974 cat. 32, #86, second quarto ed., 1813, original boards (£80). Minkoff, Oct. 1974 cat., #31, first quarto ed., 1808, uncut ($650). Maggs, Oct. 1974 cat. 191, #371, first quarto ed., 1808, incorrectly described as a folio (£175). Duschnes, Nov. 1974 cat. 208, #14, first quarto ed., 1808 ($550); Fall 1975 cat. 211, $22, first ed. folio “proof” issue, 1808 ($1250); #23, first quarto ed., 1808, uncut in original boards ($850). Hauswedell & Nolte, 26-28 Nov. 1975 cat. 208, #607, first ed. quarto, 1808 (1500 W. Ger. marks). Boydell’s Graphic Illustrations of the Dramatic Works of Shakespeare. c. 1803. Walford, Summer 1974 cat. A/223, #80, lacking frontispiece (£66); same vol., Nov. 1974 cat. A/226, #57 (£64). Bryant, Jacob. A New System, or, an Analysis of Ancient Mythology. 3 vols., 1774-76. SH, 1 May 1975, #328, with 5 other vols. (Todd, £14). Argosy, July 1974 cat. 627, #81, disbound ($50). Burger, G. A. Leonora. 1796. Argosy, July 1974 cat. 627, #60 ($200). Catullus. Poems of. 1795. Sterling Books, Nov. 1975 cat. S.9, #146 (£28). Darwin, Erasmus. The Botanic Garden. First ed. of Part I with Blake’s pls., 1791. SL, 12 Feb. 1974, #414 (F. Swann, £50). SH, 13 March 1975, #26 (B. Walton, £50). SL, 17 June 1975, #174, worn (bought-in). SH, 4 July 1975, #339, 2 pls. hand-colored, lacking 4 pls. R. & J. Balding Ltd., April 1974 cat. 14, #12 (£160). Lamesa Booksellers, Oct. 1974 cat. 27, #77 ($375). E. M. Lawson, Nov. 1975 cat. 188, #133 (£70). Second ed. of Part I, 1791. C, 5 Feb. 1975, #114, badly worn, with Hayley, Plays of Three Acts, 1784 (Morris, £12). SL, 17 March 1975, #5 (S. Heddon, £36). Third ed. of Part I, with the extra pl., 1795. SL, 18 Feb. 1974, #78 (Blackwell, £120); 4 Nov. 1974, #203, worn (Korn, £14); 11 March 1975, #318, worn (E. M. Lawson, £55). SH, 3 July 1975, #163, lacking 3 pls. SL, 29 July 1975. #407 (£45). Quaritch, Summer 1974 cat. 936, #302 (£280). Blackwell’s, Summer 1974 cat. 1004, #140 (£185); Nov. 1975 cat. 1035, #70 (£185). Duschnes, Nov. 1974 cat. 208, #10 ($675). Sterling Books, April 1975 cat. S. 7, #200 (£125). Marlborough Rare Books, July 1975 cat. 76, #15 (£150). E. M. Lawson, Nov. 1975 cat. 188, #134 (£95). Darwin, Erasmus. The Poetical Works. 3 vols., 1806. Although not listed in Bentley & Nurmi, this work contains Blake’s reduced pls. which first appeared in the octavo ed. of The Botanic Garden, 1799. C, 6 Aug. 1975, #429 (£37). Enfield, William. The Speaker. 1780 reissue of 1774 ed. Lamesa Booksellers, Fall 1975 cat. 30, #75 ($125). Flaxman, John. Compositions from the Works and Days and Theogony of Hesiod. 1817. C, 30 April 1975, #106, original boards, foxed (£55); 20 May 1975, #210, with Flaxman’s Aeschylus and Piranesi’s Antichita Romane (£16); 6 Aug. 1975, #70, with Flaxman’s Iliad and Odyssey, 1805, and Aeschylus, 1831 (£152). Marlborough Rare Books, July 1975 cat. 76, #254, with Flaxman’s Aeschylus, 1831 (£135). Duschnes, Fall 1975 cat. 211, #25, with Flaxman’s Iliad, Odyssey, and Aeschylus ($275). Flaxman, John. The Iliad of Homer. 1805. C, 30 April 1975, #104, original boards, with Flaxman’s Odyssey, 1805 (£28). Duschnes, Nov. 1975 cat. 208, #13, with Flaxman’s Odyssey, 1805 ($200). Marlborough Rare Books, July 1975 cat. 76, #255, with Flaxman’s Odyssey, 1805 (£70). See also Flaxman’s Hesiod, above. Gay, John. Fables. 1793. C, 27 Feb. 1974, #68 (Robinson, $230). SH, 31 Oct. 1974, #691 (F. Edwards, £80); 31 Jan. 1975, #422, worn (D. Heald, £45). SBNY, 5 March 1975, #153, with 3 other titles ($275). SH, 5 June 1975, #167, lacking list of subscribers (I. Sanger, £48). C, 26 Nov. 1975, #238 (Traylen, £58). Blackwell’s Spring 1974 cat. 992, #186, large paper issue uncut (£250). Quaritch, Summer 1974 cat. 936, #303 (£250). Thorp, Summer 1974 cat. 694, #625 (£75). Blackwell’s, Dec. 1974 cat. 1012, #179 (£75). Walford, April 1975 cat. A/213, #291 (£83); same vol., June 1975 cat. A/234, #166 (£81). Rota, July 1975 cat. 16, #39, second ed. (£100). Hartley, David. Observations on Man. 1791. Sterling Books, Oct. 1975 cat. S. 8, #37 (£65). Hayley, William. Ballads. 1805. SH, 16 Oct. 1975, #1146, first states of the pls., pl. 2 illus. (J. Schiller, £144). Hayley, William. The Life of George Romney. 1809. SL, 5 Nov. 1974, #312, worn (Sanders, £38). Sterling Books, July 1974 cat. 29, #248 (£34). Export Book Co., May 1975 cat. 738, #239 (£40). Duschnes, Fall 1975 cat. 211, #24 ($75). Hayley, William. The Life, and Posthumous Writings, of William Cowper. 1803-04. First ed. unless noted otherwise. SH, 10 April 1975, #157, lacking half-titles (Maggs, £82); 5 June 1975, #195, with supplementary pages bound into vol. 3, lacking half-titles, worn (Fellner, £18); #488, with Cowper: Illustrated by a Series of Views, 1803 (C. W. Cox, £44). C, 6 Aug. 1975, #225, lacking half-titles (£58). Maggs, Oct. 1974 cat. 191, #415, second ed. (£38). Blackwell’s, Dec. 1974 cat. 1012, #108, lacking pl. 6 (£50). Richard Booth, May 1975 cat., #E, with supplementary vol. (£75). Grinke, Aug. 1975 cat. 12, #260, second ed. with supplementary vol. (£55). T. & L. Hannas, Fall 1975 cat. 48, #125, with supplementary vol. (£90). Hayley, William. The Triumphs of Temper. 12th ed., 1803. SL, 18 Feb. 1974, #79 (F. Edwards, £55). SH, 1 May 1975, #195 (B. Slater, £25). SL, 19 May 1975, #181, inscribed “Mrs. [Mary] Tighe’s gift to Harriet Sher June 1804” (A. G. Thomas, £120). C, 4 June 1975, #131, original boards uncut (£100). R. & J. Balding, April 1975 cat. 14, #13 (£50). Quaritch, Summer 1974 cat. 936, #306, large paper (£200); Autumn 1974 cat., #17 (£110). Falkner Greirson, 1974 supplementary cat. 4, #143 (£48). Lamesa Booksellers, Oct. 1974 cat. 27, #107 ($125). Alan Thomas, Fall 1975 cat. 32, #85 (£130). Duschnes, Nov. 1974 cat. 208, #12 ($200). William Wreden, Oct. 1975 cat. 52, #446, original boards uncut ($250). E. M. Lawson, Nov. 1975 cat. 188, #138, lacking half-title (£85). Hoare, Prince. An Inquiry into . . . the Arts of Design in England. 1806. H. Fellner, Nov. 1974 cat. 86 (£10). Marlborough Rare Books, July 1975 cat. 76, #311 (£48). Hogarth, William. Works of. Issues which presumably contain Blake’s pl. of “The Beggars Opera.” SB, 30 April 1974, #260, Heath ed., n.d. (McDonald Prints, £190). SL, 5 Nov. 1974, #418, Heath ed., 1822 (G. Walford, £300); #419, Heath ed., n.d. (Foyle, £220); #420, Heath ed., n.d. (Foyle, £320); #421, Heath ed. n.d. (F. Nolan, £220); #422, Heath ed., n.d. (T. E. Schuster, £240). SH, 4 Feb. 1975, #324, Heath ed., 1822 (Traylen, £90); #325, Heath ed., 1822 (Walford, £250); 326, Heath ed., n.d. (Traylen, £180). SL, 6 May 1975, #341, Boydell ed., 1790 (£280). SH, 5 June 1975, #206, Heath ed., n.d. (Hyde Park Books, £230). SL, 28 July 1975, #255, Heath ed., n.d. (£260); #256, Heath ed., n.d. (£220). C, 30 July 1975, #289, Heath ed., 1822 (£158); 6 Aug. 1975, #325, Heath ed., n.d. (£200); 14 Oct. 1975, #94, Heath ed., 1822 (withdrawn). Walford, April 1975 cat. A/232, #54, Heath ed., 1822 (£420); July 1975 cat. A/235, #24, Heath ed., 1822 (£415); begin page 57 | ↑ back to top #25, Heath ed. n.d. (£380). Bow Windows Book Shop, Oct. 1975 cat. 71, #211, Heath ed., n.d. (£350). Hunter, John. An Historical Journal. Quarto ed., 1793. Christie’s Australia, 25 Sept. 1974 ($260 Australian). SL, 17 Dec. 1975, #652. Francis Edwards Ltd., Fall 1974 cat. 988, #316 (£350). Export Book co., April 1974 cat. 726, #24 (£285). E. M. Lawson, April 1975 cat. 187, #512 (£210). Josephus. The Whole Genuine and Complete Works. Bentley & Nurmi third issue, c. 1800. Howes, Fall 1974 cat. 187, #242 (£30). Lavater, J. C. Aphorisms on Man. SL, 10 March 1975, #2, first ed., 1788, Sir William Stirling Maxwell’s copy (withdrawn). Grinke, Summer 1974 cat. 9, #240, second ed., 1789 (£45). Lavater, J. C. Essays on Physiognomy. C, 27 Feb. 1974, #293, first ed., 1789-98 (Joseph, $196); #326, reissue of 1810 (Sanders, $97). Although not listed in Bentley & Nurmi, the 1810 issue contains Blake’s four plates. SL, 6 May 1975, #326, first ed., 1789-98 (£130); 29 July 1975, $449, first ed., 1789-98 (£75). Export Book Co., March 1975 cat. 737, #44, first ed., 1789-98 (£60). Sterling Books, April 1975 cat. S. 7, #221, reissue of 1810 (£150). Marlborough Rare Books, July 1975 cat. 76, #352, first ed., 1789-98 (£150). Malkin, Benjamin Heath. A Father’s Memoirs of his Child. 1806. SL, 27 Oct. 1975, #200, William Beckford’s copy with an inserted page of annotations by him (A. G. Thomas). Beckford writes that this volume contains “some splendid specimens from that Treasury of nonsense—Mr Blake the mad draughtsman’s poetical compositions—Tiger, Tiger burning bright/ In the forests of the night -&.- Surely the receiver & Disseminator of such trash is as bad as the Thief who seems to have stolen them from the walls of Bedlam.” One can only wonder why Beckford acquired copies of six of Blake’s illuminated books when he held such opinions. Grinke, Summer 1974 cat. 9, #266, original boards uncut (D60). Marlborough Rare Books, July 1975 cat. 76, #8, (£75). Duschnes, Fall 1975 cat. 211, #21 ($200). Novelist’s Magazine, 1782-90. Walford, Summer 1974 cat. A/223, #119, a collection of 353 pls. from the Magazine (£92); same collection, Nov. 1974 cat. A/226, #94 (£90). Rees, Abraham. The Cyclopaedia. 45 vols. (including 6 vols. of pls. ), 1819-20. SH, 4 July 1975, #408, worn (£170). Richard Booth Ltd., Feb. 1975 cat., #111 (£225); #112, made up from 2 sets (£150). Walford, April 1975 cat. A/231, #311, pls. vol. III only (£35); Fall 1975 cat. A/236, #53, pls. vol. I only (£35); #54, pls. vol. II only (£35); #55, pls. vol. III only (£35); #56, pls. vol. IV only (£56). Ritson, Joseph. A Select Collection of English Songs. 1783. SH, 31 Oct. 1974, #786 (Pickering & Chatto, £45). SBNY, 21 Jan. 1975, #321, with Ritson’s Robin Hood, 1795 ($200). Anthony Laywood, April 1975 cat. 35, #18, lacking half-titles (£80). Salzmann, C. G. Elements of Morality. Duschnes, Fall 1975 cat. 211, #20 ($350). Scott, John. Poetical Works. Lawson & Co., Oct. 1974 cat. 185, #40, second ed., 1786 (£48). Peter Murray Hill,[e] 1975 cat. 128, #282, first ed., 1782 (£75). Shakespeare. The Dramatic Works. Boydell ed., 9 vols., 1802. C, 8 Oct. 1975, #188 (£20). Stedman, J. G. Narrative, of a five years’ expedition, against the revolted Negroes of Surinam. C, 27 Feb. 1974, #351, first ed., 1796, with pls. hand colored, together with Virgil, Works, 1654 (Foyles, $368). Stuart, James, and Nicholas Revett. The Antiquities of Athens. Falkner Greirson, 1974 supplementary cat. 4, #292, 4 vols., 1762-1816 (£400). Vetusta Monumenta. Essay by Joseph Ayloffe in the 1780 issue. Marlborough Rare Books, July 1975 cat. 76, #522, 6 vols. 1747-1868, lacking a few pls. (£250). Virgil. Pastorals of. Thornton’s ed., 1821. Weston Gallery, Fall 1975 cat. 10, #4, vol. 1 only, 4 cuts illus. ($2078.35). Young, Edward. Night Thoughts. 1797. SL, 18 Feb. 1974, #245, soiled, with leaf of explanation (M. Wilson, £240). SBNY, 28 Feb. 1974, #429, uncut, with leaf of explanation ($1400). SH, 25 July 1974, #291, soiled, with leaf of explanation, uncut (P. Beres, £650). C, 30 April 1975, #164, original boards uncut, lacking explanation, broken & worn (£900). SH, 20 Nov. 1975, #95, original boards uncut. Duschnes, Nov. 1974 cat. 208, #11, with leaf of explanation ($3250); Nov. 1975 cat. 212, #14A, with leaf of explanation ($2500). Hauswedell & Nolte, 26-28 Nov. 1975 cat. 208, #608 (3000 W. Ger. marks). Blackwell’s, Nov. 1975 cat. 1035, #397, lacking leaf of explanation (£425). Robertson, W. Graham. Autograph MS. of “Catalogue of Works of Blake” in Robertson’s collection, 275 pp. SL, 10 March 1975, #3, with a preliminary draft and a copy of Preston, The Blake Collection of Robertson, 1952 (Maggs, £100). Now in the author’s collection. Todd, Ruthven. Typescript, presented by Todd to Robertson, of a catalogue of the latter’s Blake collection. 1942. SL, 10 March 1975, #4 (Maggs, £7). Now in the author’s collection. Barry, James. “Eastern Patriarch,” lithograph. SB, 15 April 1975, #3 (£150). Basire, James. “The Embarkation of King Henry VIII at Dover,” engraving, Basire after Grimm. SB, 26 Nov. 1974, #148 (£85). Calvert, Edward. “The Bride,” line engraving, third state. SB, 24 June 1975, #7 (£130). Thackrey & Robertson, Blake and Palmer cat., Sept.-Oct. 1975, #3 ($1113). “The Brook,” wood engraving, third state. SB, 30 April 1974, #102 (Garton, £150); 15 April 1975, #17 (£150). Weston Gallery, Sept. 1974 cat. 8, #4, illus. ($468). Thackrey & Robertson, Blake and Palmer cat., Sept.-Oct. 1975, #5 ($655). “The Chamber Idyll,” wood engraving, second state. SB, 24 June 1975, #9, with “The Return Home,” wood engraving, final state, and the contents page from the Carfax Portfolio (£160). Thackrey & Robertson, Blake and Palmer cat., Sept.-Oct. 1975, #8 ($1020). “The Cyder Feast,” wood engraving, third state. SB, 24 June 1975, #5 (£60). Thackrey & Robertson, Blake and Palmer cat., Sept.-Oct. 1975, #2 ($995). “The Flood,” lithograph, only state. SB, 30 April 1974, #102b (Garton, £200); 15 April 1975, #18 (£200). “The Lady with the Rooks,” wood engraving, third state. SB, 24 June 1975, #8, with “The Sheep of His Pasture,” engraving, second state (£90). Thackrey & Robertson, Blake and Palmer cat., Sept.-Oct. 1975, #6 ($595). “The Ploughman,” wood engraving, third state. SB, 24 June 1975, #6, illus. (£90). Thackrey & Robertson, Blake and Palmer cat., Sept.-Oct. 1975, #1 ($995). “The Return Home,” wood engraving, second state. C, 7 Oct. 1975, #2, illus. Thackrey & Robertson, Blake and Palmer cat., Sept.-Oct. 1975, #7 ($595). “The Sheep of His Pasture,” engraving, second state. Thackrey & Robertson, Blake and Palmer cat., Sept.-Oct. 1975, #4 ($765). A Memoir . . . by His Third Son, 1893. With impressions of Calvert’s metal and wood engravings. C, 30 July 1975, #25 (£893). Flaxman, John. (See also under Blake Books, above). Design for the base of a statue to commemorate British victories, pencil & gray ink, 14 × 25.5 cm. SL, 19 June 1975, #54 (£2). This is the same monument presented in Flaxman’s A Letter to the Committee for Raising the Naval Pillar, 1799, but it is not directly related to any of the three pls. by Blake in that publication. “Despair Surrounded” and “Slay-God,” both inscribed “W. Blake.” Pencil & gray ink. And four sheets of sketches in the style of Romney. C, 25 Feb. 1974, #155 (Powney, $193). “Joseph’s Dream,” pen & ink, gray wash, 7 3/8 × 9 3/8 in. C, 22 April 1975, #9 (£178). Illustration to A Midsummer Night’s Dream. Pen & ink, 7 1/2 × 7 1/4 in. Sabin Gallery, Spring Exhibition April-May 1975, #59. Three mythological figures, ink & wash, 47 × 62 cm. SL, 26 March 1975, #204, illus. (£420). The reproduction makes me a bit suspicious of the attribution. A scene from the Odyssey, Bk. VI, gray ink, inscribed Od.6-319. 20 × 31 cm. SL, 26 March 1975, #143 (£100). Figure studies, ink & wash on 2 sheets each 19 × 13.5 cm. SL, 26 March 1975, #141 (£30). Study for a memorial to Lord Rodney, ink & wash, 19.5 × 13.5 cm. With a study of two girls, ink & wash, 21 × 14 cm. SL, 26 March 1975, #142 (£50). Compositions from the Tragedies of Aeschylus, engraved by Piroli and Howard after Flaxman, 1831. SB, 30 April 1974, #33 (Sheldrake, £5); 17 Sept. 1974, #11 (withdrawn). C, 30 April begin page 58 | ↑ back to top 1975, #105, original boards, foxed (£10). La Divina Comedia di Dante . . . Disegnata da Giovanni Flaxman, engraved by Piroli after Flaxman. London, 1793. Salloch, Nov. 1974 cat. 317, #55 ($225). A.L.s., 3 pp., 12 Feb. 1812, to an unnamed lord, refusing to have certain conditions written into their agreement for a statue. SL, 24 June 1975, #277 (Miss W. Myers, £30). Fuseli, Henry. “The Death of Oedipus,” pen & wash, 10 3/8 × 14 1/8 in. C, 16 July 1974, #74, illus. (Schickman, $5290). “Jeremiah,” based on Michelangelo’s figure in the Sistine Chapel. Pen & ink, 8 1/8 × 6 3/8 in. C, 5 March 1974, #74, illus. (Agnew, $1159). Study of naked athletes. Pen & ink, signed, 12 1/4 × 8 in. C, 5 Nov. 1974, #110 (Renner, $706). A woman looking out of a window, sepia drawing, 12 × 18.5 cm. SL, 31 Jan. 1974, #124 (G. Norman, £30). The catalogue designation “H. Fuseli” indicates that this is a work in Fuseli’s style by a contemporary of the artist. A young woman (recto), two women (verso). Pencil, 12 1/2 × 7 1/2 in. C, 5 March 1974, #90, illus. (Colnaghi, $4347). “Evening thou Bringest All,” lithograph. SB, 15 April 1975, #8 (£500). “The Weird Sisters,” mezzotint by John Raphael Smith after Fuseli, 43.8 × 55.3 cm. SB, 22 July 1975, #45 (£12). Palmer, Samuel. An Arcadian landscape, watercolor, 5 7/8 × 10 3/8 in. C, 5 March 1974, #92, illus. (Agnew, $11,109). “The End of Day,” watercolor, 7 1/2 × 16 1/2 in. C, 4 Nov. 1975, #82, illus. (£1365). “Near Sevenoaks,” watercolor, 24 × 35.5 cm. SL, 27 Nov. 1975, #14, illus. (£5100). A seaside town with two figures passing a chapel, ink sketch, signed and dated 6 Jan. 1824. 16.5 × 13.5 cm. SL, 16 July 1975, #133, illus. (£200). “Tintern Abbey,” watercolor, 25.5 × 37 cm. SL, 27 Nov. 1975, #15, illus. (£4800). “The Bellman,” etching. SB, 17 Sept. 1974, #158, seventh state (Edmunds, £170). SBNY, 6 Feb. 1975, #192, fifth state, illus. ($800). C, 25 March 1975, #141, fifth state (W. Weston, $655); #142, Seventh state (Gregory, $327). SB, 7 Oct. 1975, #18, fourth state, illus. Thackrey & Robertson, Blake and Palmer cat., Sept.-Oct. 1975, #XI, sixth state ($1075). “Christmas, or Folding the Last Sheep,” etching. SB, 7 Jan. 1975, #16, fourth state (£110). SBLA, 18 Feb. 1975, #234, fourth state, illus. ($225). SB, 7 Oct. 1975, #14, third state, illus. Thackrey & Robertson, Blake and Palmer cat., Sept.-Oct. 1975, #IV, third state ($1380). “The Cypress Grove,” etching. Thackrey & Robertson, Blake and Palmer cat., Sept.-Oct. 1975, #XV-1, first state ($460); #XV-2, second state ($345). “The Early Ploughman,” etching. C, 25 Feb, 1974, #113, eighth state (Lott, #386); 16 July 1974, #214, fourth state ($265). SB, 17 Sept. 1974, #13, third state (£110); 7 Jan. 1975, #12, fourth state (£85). SBNY, 6 Feb. 1975, #191B, eighth state ($110). SBLA, 18 Feb. 1975, #235, fifth state, illus. ($350). C, 25 March 1975, #139, fifth state (Lott, $277). SB, 7 Oct. 1975, #17, sixth state. Colnaghi, Romantic Landscape Etchings and Woodcuts, April-May 1975, #56, fifth state, illus. (£200). Thackrey & Robertson, Blake and Palmer cat., Sept.-Oct. 1975, #IX-1, fourth state ($422); #IX-2, seventh state ($1300); #IX-3, fourth state ($770). V. K. Dailey, Dec. 1975 cat. 3, #9, eighth state ($275). “Harvest Under a Crescent Moon,” wood-engraving from the 1932 ed. of 50. SB, 8 Jan. 1974, #1, illus. (Maggs, £620). No contemporary impressions are known of Palmer’s only wood engraving, and only 55 impressions were pulled before the block was destroyed in 1940. “The Herdsman’s Cottage,” etching, second state unless noted otherwise. SB, 30 April 1974, #75, foxed (J. Bamber, £85); #76, time stained (H. Moss, £95); #76a, with “The Vine, or Plumpy Bacchus,” etching, fourth state (Knoedler, £70); 2 July 1974, #246 (B. Carter, £70); #247 (Louise King, £65); #248 (Weston, £45); #249 (S. Hinton, £65). C, 16 July 1974, #196 (Knoedler, $277); #213 (Abelson, $131). SB, 17 Sept. 1974, #14, illus. (£100). SBNY, 6 Feb. 1975, #191A ($150). SBLA, 24 Sept. 1974, #216 (Zeitlin, $300); 18 Feb. 1975, #233, illus. ($200). C, 25 March 1975, #136 (Louise King, $50). SB, 15 April 1975, #33 (bought-in); 7 Oct. 1975, #13, first state; #19, illus; #20. C, 14 Oct. 1975, #353 (£74). Weston Gallery, Jan. 1975 cat. 12, #19, illus. ($235). Colnaghi, Romantic Landscape Etchings and Woodcuts, April-May 1975, #59 (£140). Thackrey & Robertson, Blake and Palmer cat., Sept.-Oct. 1975, #III ($385). V. K. Dailey, Dec. 1975 cat. 3, #32 ($235). “The Homeward Star,” etching. C, 16 July 1974, #198, fourth state (Lott, $214). SB, 15 April 1975, #35, first state (£50). Thackrey & Robertson, Blake and Palmer cat., Sept.-Oct. 1975, #XIV-1, first state ($460); XIV-2, second state ($345). “The Lonely Tower,” etching. SB, 17 Sept. 1974, #152, impression after the pl. was canceled (£70); 7 Jan. 1975, #15, sixth state, time stained (£150). SBNY, 6 Feb. 1975, #192A, sixth state, illus. ($850). C, 25 March 1975, #143, fourth state (Edmunds, $504). SBNY, 14 Nov. 1975, #451, trial proof of fourth state, illus. ($1750). “Moeris and Galatea,” etching. SB, 30 April 1974, #78, third state (Lott, £60); 17 Sept. 1974, #153, fourth state (£45). Thackrey & Robertson, Blake and Palmer cat., Sept.-Oct. 1975, #XVII-1, first state ($460); #XVII-2, second state ($345). “The Morning of Life,” etching. SB, 17 Sept. 1974, #12, final state, slightly stained (withdrawn); 7 Jan. 1975, #13, third state, time stained, illus. (£140). C, 25 March 1975, #140, third state (Scott, $227). SB, 15 April 1975, #36, sixth state (£60). Thackrey & Robertson, Blake and Palmer cat., Sept.-Oct. 1975, #X, seventh state ($575). “Opening the Fold, or Early Morning,” etching. C, 25 Feb. 1974, #114, final state (Chapman, #362); 16 July 1974, #197, final state (Lott, $327). SBNY, 6 Feb. 1975, #192V, second state, illus. ($350). C, 25 March 1975, #144, fourth state (Page, $403). SB, 24 June 1975, #42A, eighth state (£100). C, 30 July 1975, #131, fifth state, illus. (£137). Colnaghi, Romantic Landscape Etchings and Woodcuts, April-May 1975, #58, fifth state, illus. (£350). Thackrey and Robertson, Blake and Palmer cat., Sept.-Oct. 1975, #XIII-1, third state ($1275); #XIII-2, seventh state ($690); #XIII-3, eighth state ($425). “The Rising Moon,” etching. SB, 30 April 1974, #77, eighth state (Weston, £130); 17 Sept. 1974, #152, seventh state (£70). Weston Gallery, Nov. 1974 cat. 10, #42, proof between sixth and seventh states, illus. ($705). Colnaghi, Romantic Landscape Etchings and Woodcuts, April-May 1975, #60, seventh state, illus. (£200). Thackrey & Robertson, Blake and Palmer cat. Sept.-Oct. 1975, #VII, seventh state ($690). “The Sepulchre,” etching. Thackrey & Robertson, Blake and Palmer cat., Sept.-Oct. 1975, #XVI-1, first state ($460); XVI-2, second state ($345). “The Skylark,” etching. SB, 17 Sept. 1974, #155, seventh state (£95); 24 June 1975, #41, eighth state (£90); 7 Oct. 1975, #12, fifth state, illus. Weston Gallery, May 1975 cat. 5, #22, seventh state, illus. ($472). Thackrey & Robertson, Blake and Palmer cat., Sept.-Oct. 1975, #II, seventh state ($615). “The Sleeping Shepherd,” etching. SB, 2 July 1974, #250, fourth state (Lady Firth, £170); 17 Sept. 1974, #180, second or third state, relaid India “proof” (£80); 7 Oct. 1975, #15, second state. C, 14 Oct. 1975, #354, fourth state, with 2 other prints (£74). Colnaghi, Romantic Landscape Etchings and Woodcuts, April-May 1975, #57, fourth state (£150). Thackrey & Robertson, Blake and Palmer cat., Sept.-Oct. 1975, #VI, fourth state ($805). “The Vine, or Plumpy Bacchus,” etching, fourth state. C, 25 March 1975, #137, (Morris Ayres, $50). SB, 15 April 1975, #21. Thackrey & Robertson, Blake and Palmer cat., Sept.-Oct. 1975, #V ($345). “The Weary Ploughman,” etching. SB, 7 Jan. 1975, #132, eighth state (£120). C, 25 March 1975, #138, seventh state (Scott, $227). SB, 24 June 1975, #42, sixth state, illus. (£200); 7 Oct. 1975, #16, seventh state. Thackrey & Robertson, Blake and Palmer cat., Sept.-Oct. 1975, #VIII, eighth state ($575). “The Willow,” etching. SB, 7 Jan. 1975, #14, second state (£70). SBLA, 18 Feb. 1975, #232, second state, illus. ($130). SB, 24 June 1975, #40, third state (£80). Thackrey & Robertson, Blake and Palmer cat., Sept.-Oct. 1975, #I-1, second state ($435); I-2, third state ($770). Weston Gallery, Sept. 1975 cat. 8, #21, second state, illus. ($319.50). An English Version of the Eclogues of Virgil by Samuel Palmer. First ed., 1883. SH, 8 Feb. 1974, #440 (A. K. Henderson, £390). SL, 20 Feb. 1974, #582 (D. McAlpine, £500). SB, 17 Sept. 1974, #15, large paper copy, one pl. illus. (£290). C, 13 Nov. 1974, #53 (Henderson, $576). SL, 12 March 1975, #767, slightly worn (Hatchard’s £260). C, 30 July 1975, #132, illus. (£399). SH, 30 Oct. 1975, #278; 21 Nov. 1975, #285; #286, illus. Thin, Fall 1975 cat. 341, #482 (£65). Quaritch, July 1975 cat. 950, #260, large paper copy (£750). Second ed., 1884. SB, 24 June 1975, #43, one pl. illus. (£400). Etchings for the Art-Union of London, 1857. Includes Palmer’s “Sleeping Shepherd,” “The Rising Moon,” “The Skylark,” and 27 pls. by other hands. SB, 24 June 1975, #44, “The Rising Moon” illus. (£250); 7 Oct. 1975, #22. A. H. Palmer. The Life and Letters of Samuel Palmer. 1892. SL, 12 March 1975, #768 (Ars Artis, £60). Marlborough Rare Books, July 1975 cat. 76, #422, large paper copy (£200). A. H. Palmer. Samuel Palmer, A Memoir. 1882. SH, 6 June begin page 59 | ↑ back to top 1974, #17, rubbed, loose (Hatchard’s, £170). SB, 7 Oct. 1975, #23. 9 A.Ls.s. by Palmer, and one by his father, to George Richmond, 10 May 1827-16/20 Oct. 1834. SL, 24 June 1975, #241 (Seven Gables Bookshop, £1300); #241A, autograph MS. entitled “How to choose Teas” (D. A. Heald, £65). These are all printed in Raymond Lister, ed., The Letters of Samuel Palmer, vol. I. A.L.s., 19 Aug. 1835, to George Richmond. SL, 29 Oct. 1975, #125. The letter is printed in Lister, ed., Letters of Palmer, I, 71-3, where “not” is erroneously inserted in one sentence. A.L.s., 5 June 1836, to George Richmond. SL, 29 Oct. 1975, #136. Printed in Lister, ed., Letters of Palmer, I, 75-80. 4 A.Ls.s., 2 June 1838-19 Sept. 1839, to George and Julia Richmond. SL, 29 Oct. 1975, #137. All are printed in Lister, ed., Letters of Palmer. 51 A.Ls.s., 1 typed L.s., 1 A.L. unsigned by Alfred Herbert Palmer, the artist’s son, to F. L. Griggs, 1925-31. c. 170 pp. concerning Samuel Palmer. SL, 15 July 1975, #184 (J. Graffy, £300). Richmond, George. “Jesus and the Disciples in the Garden of Gethsemene.” Sepia ink, 23 × 19 cm. SL, 27 Nov. 1975, #16, illus. (£50). Also in this sale were 20 other, less Blake-like, drawings by Richmond & 4 by Henry Walter. “The Fatal Bellman,” engraving. SB, 30 April 1974, #5, illus. (Baskett & Day, £520). C, 25 March 1975, #165, with “Proof” in lower right margin, illus. (Somerville, $1186). An impression of this rare work, plus Richmond’s “The Shepherd,” were recently acquired by the Huntington Library. Robertson, W. Graham. Color printed drawings by Robertson in imitation of Blake’s technique. SL, 10 March 1975, #121, “Orc or Flames of Desire,” the block and first impression (Maggs, £122, now in the author’s collection); #122, a woman and five girls, block and four variant impressions (N. A. Milton, £20); #123, “Anemone’s Ball,” block and three impressions (Abbott & Holder, £10); #124, “Redlands Farm,” block and two impressions (Abbott & Holder, £10); #125, girl in a landscape, two impressions, plus a “print after a design by Blake” (Abbott & Holder, £6). Smetham, James. 10 small watercolors, C, 21 Oct. 1975, #147-156, two illus. (£336-£68). Tatham, Frederick. Portrait of a man seated at a writing desk, and a portrait of a woman seated on a balcony. Signed and dated 1846. Watercolors. 23 × 16 1/8 in. C, 7 Oct. 1975, #76 (£47). “Cain and Abel,” and “The Deluge,” a pair, wash drawings each 21.5 × 18 cm. By a “follower of William Blake.” SL, 16 July 1975, #241 (£40).